French Vegans who are sometimes perceived like aliens can set their minds at rest: their ancestors, known as the eccentric légumistes, were regarded at best as wacky Utopians and at worst as worrying rebels. The term légumiste was originally created (in the 1750s ) to designate not vegetarians but gardeners who grew vegetables. Its meaning was extended to market gardening but failed to get into the Dictionnaire de l’Académie française, unlike its more common predecessor and rival maraîcher. 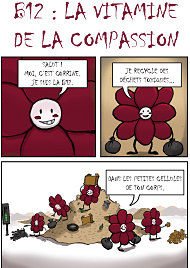 From the 1850s, légumiste acquired a new meaning: a person who eats only vegetables. Before then there was no French word to designate vegetarians apart from phythagoricien (Pythagorean) which remained restricted due to the multiple meanings of the term (philosopher, ascetic, vegetarian, etc) . The first use of the word légumiste to mean vegetarian dates from 1851 in France and Italy (legumista, plur. legumisti), reaching. Germany in 1852 (legumist, plur. legumisten) . As it was rarely used in Italian or German and had already existed in French with another meaning, it most likely originated in France. 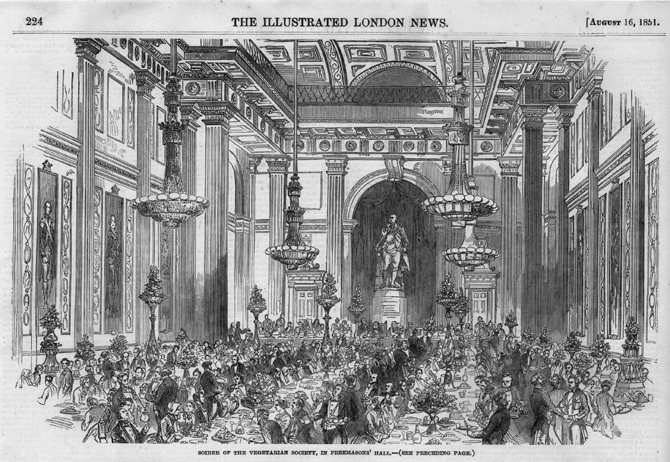 Following the first ever World Fair in London, at which the existence of the British Vegetarian Society was revealed to the French, anglophile and medical French journals used the word végétarisme to refer to what more popular and polemical reviews unsurprisingly prefered to call légumisme, so légumiste prevailed for a while. At first, the term légumiste was most likely ironic, as explained in the Schweizerisches Correspondenzblatt für Aerzte und Apotheker (February 1852, vol. 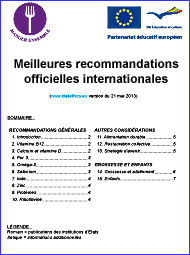 III, no 2): “In addition to those herbarians is the sect of the “vegetarians”, also mockingly known as the “légumistes”, who for religious reasons live only on plant foods” (« Neben diesen Herbariern existirt auch die Sekte der “Vegetarier” spottweise auch “Legumisten” genannt, welche theils aus religiösen Gründen einzig aus Pflanzennahrung leben »). According to Alfred Delvau , légumiste even reached French criminal slang). It is even more certain that vegetarians were extensively ridiculed at the time, and often the reluctant heroes of works on eccentrics. Their leader, sometimes referred to as the “chef des légumistes”, was partially responsible for this situation. Jean-Antoine Gleizes, who died in 1843, just after publishing his major work Thalysie ou la Nouvelle Existence (1840-42), tended to rewrite history in accordance with his personal views. 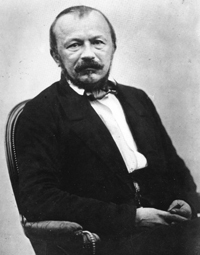 According to Edmond Texier, the writer Gérard de Nerval was also an eccentric and “a great supporter of légumisme , but in the manner of Pythagoras”. 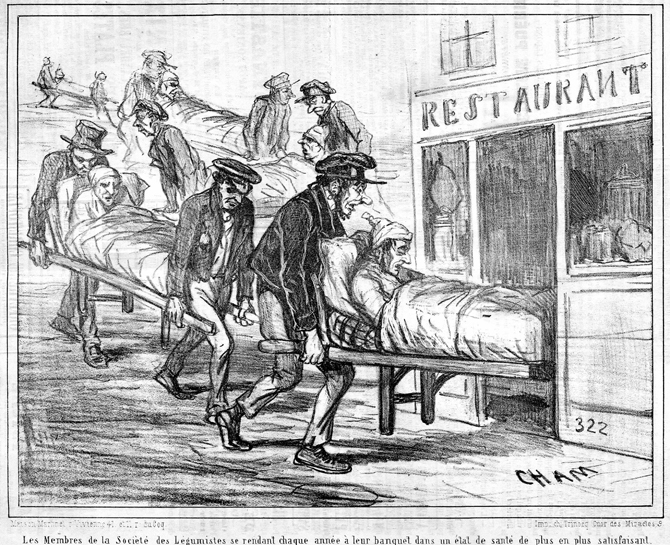 This did not stop Nerval from defending the Fatted Ox parade to which he was invited by a butcher in 1850 . He not only attended the fair but made a speech on metempsychosis implying that animals had inner human souls (according to Texier, Nerval claimed to remember his own previous lives as a sheepdog and even a fatted ox). He ended his speech to the astonished butchers by asking them to replace the fatted ox with a fatted bean. 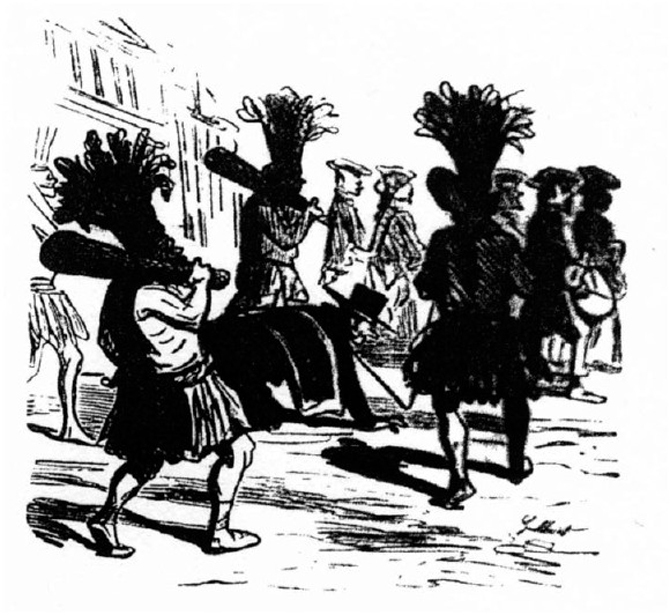 The defenders of the ox inspired the cartoonist Cham to publish a sketch (in Charivari, 3rd February 1856) showing a man on all fours in the midst of a carnival procession with the caption: “A member of the Animal Protection Society who has obtained permission to replace the ox and spare him a tiring walk.” Cham had started to pick on légumisme in 1853 with talented cartoons of sad and scrawny vegetarians (see illustration). The real or imagined eccentricities of the légumistes delighted humorists and writers who tried their best to outdo each other. The fashion for table tapping spread through France in 1853, giving rise to surprising associations such as spiritualists and légumistes. A year later Edmond Texier related in the Revue de Paris that a vegetarian séance had instructed a member of the French Academy and his fellow spiritualists to abstain from eating any animal flesh and to eat only plants. In Mystic France, subtitled “Picture of religious eccentricities of our time”, Alexandre André Jacob (known as Erdan) deals with table tappers and légumistes alike. 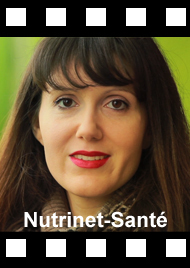 Gradually even doctors refer to the now fairly established relationship: “[…] exaggerated légumisme causes nervous system anaemia: as Gaëtan Delaunay notes, most exclusive vegetarians become spiritualists ” (Ernest Monin, L’Hygiène de l’estomac). La Châtre’s Dictionnaire universel is publically favourable to the légumistes. The original meaning (market gardening) is dealt with in one line while 25 more endorse the new sense. However, the definition is fairly restrictive as a “person who lives exclusively on vegetables”. The Grand Dictionnaire universel du xixe siècle (1873) bases its definition on Littré’s but replaces sect by association and vegetables by plants: “member of an association which imposes the obligation to live on a purely plant based diet: the Society of LÉGUMISTES.” The term légumiste was current at the time. Makes water his only drink. The word végétarien did not have that connotation, but would not be endorsed by dictionaries before 1876 (in the Larousse dictionary supplement) and 1877 (Littré). 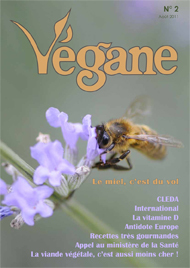 Its neutrality supplants its rival, for which substitutes are soon proposed: “[…] the Vegetarian Society, which one wag dubbed légumière or légumiste and which deserves to be called the Society of Herbivores ”. 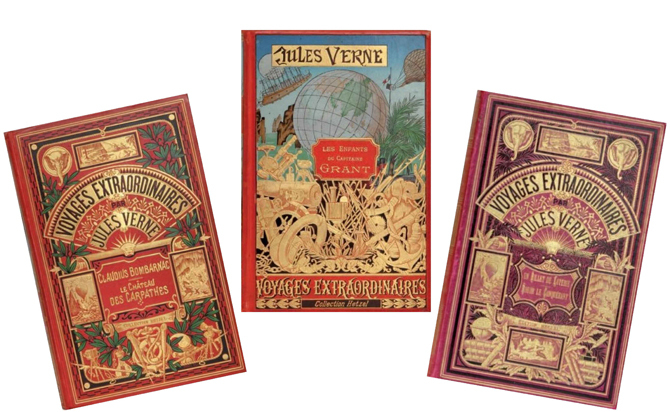 Towards the end of the 19th century the Nouveau Dictionnaire encyclopédique universel illustré still endorses légumiste, while advising: “better, végétarien”. The 20th century sounds the death knell of légumiste. From the very first edition (1906), the Petit Larousse indicates that the word is uncommon, though it only disappears from its pages altogether in 1948. « Do not kill animals. 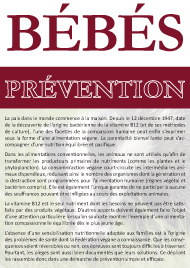 The reason why an exception was made for infants is not clearly stated, but in the absence of B12 supplements it may have been a health measure . In any case, these two examples only denote an Anglo-American origin of the concept of légumisme while the word itself is clearly French. 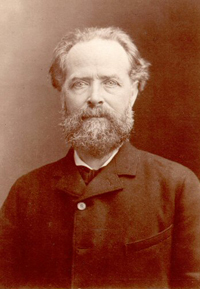 Jean-Antoine Gleizes was the main promulgator of the « herbal diet” in France (1842), though according to André Jacob it remained theoretical whilst it was actually put into practice in England. The diet promoted by Gleizes allowed some animal foods (milk and honey), unlike the above definition of légumisme. However, this requires some qualification as John Lemoinne describes a légumiste banquet where cheese pies and milk are served… This may also just be a conflict between two trends. The Methodist founders of the Vegetarian Society in England extended the concept to allow some animal by-products whereas the original creators and promoters of the word vegetarian excluded milk and honey . It is interesting to note that légumiste features next to végétalien. In the 1890s, the latter becomes widely used (as many dictionary entries show) and eventually supplants légumiste. Unlike veganism, none of the entries seems to focus on rejection of animal exploitation, but légumisme may sometimes go beyond dietary concerns when, for example, gutta-percha or rubber was discussed as a leather substitute . 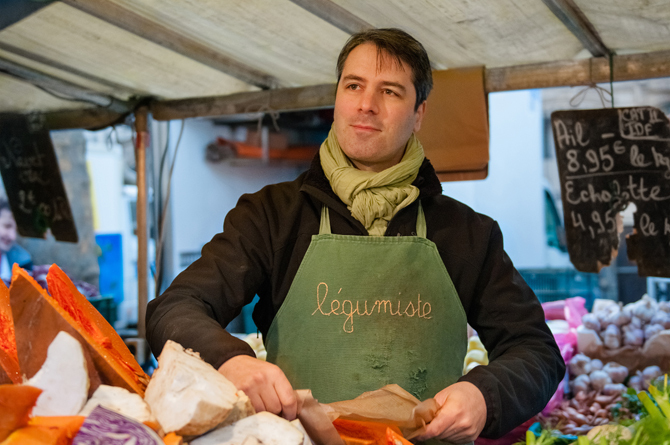 The Légumiste of the Bastille (vegan vegetable retailer). 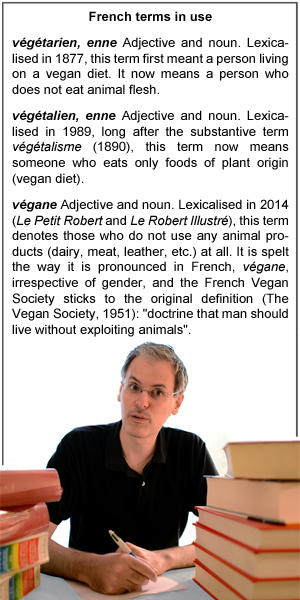 In memory of historic incivilities and to preserve cultural history, the president of the French Vegan Society has currently revived the word légumiste, but this remains a shining exception. 2. Except as an adjective in the expression « Pythagorean diet », popularised in 1750 by the translation of Antonio Cocchi’s Del vitto pitagorico (1743). 3. Respectively in the Jesuit review La Civiltà cattolica and in Schweizerisches Correspondenzblatt für Aerzte und Apotheker, a Swiss medical publication for military use. 4. 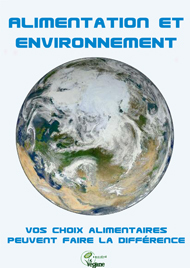 In his Dictionnaire de la langue verte, the following definition is proposed: « Person who out of respect for the animals lives solely on vegetables like a virtuous Brahmins. 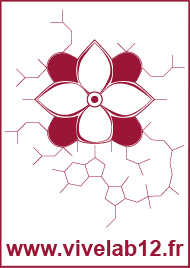 There is a Légumiste Society. » Thirty years later, in his Dictionnaire argot-français et français-argot, George Delesalle considers the term to be popular. 5. His correspondence, however, reveals that he was still eating meat in 1843. 6. As a consequence of the February 1848 revolution, the fatted ox parade was banned for two years in Paris and took place on the outskirts. The probably quite ancient fatted ox carnaval involved parading a richly decorated bovine through the town before slaughtering it. 9. French for foreigners teaching method. 10. He may have imported the term since he was a French wine merchant from Charente who established himself in Canada in 1854. 11. Léguministe is a rare variation of légumiste. Léguminivore also exists but applies only to animals. 13. In a letter to his mother (14th October 1856), Reclus uses differently légumiste and végétarien indifferently. 14. François-Vincent Raspail, Natural History of health and illness. 15. 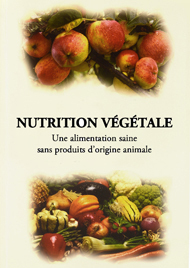 John Lemoinne translates Vegetarian Society into Société des légumistes. As he seems to hesitate, the translation may be his: « This society calls itself the Vegetarian Society, or in other words Société des légumistes. 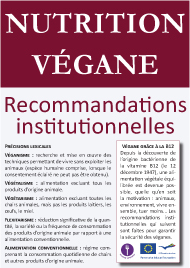 » This proposition will become very popular for several years as the French translation of Vegetarian Society. Jules Verne will even use it in In Search of the Castaways (see note 12). The use of the French word légume to translate the word English vegetable is not satisfying. As John Davis notes in « The vegetus myth », the meanings of these words have changed over time. The English vegetable had a broader sense than today and could be used to describe all kinds of plants while the French légume was more restrictive than it is today (« correctly used, it denotes certain seeds which come from pods, such as peas, broad beans, etc. » Dictionnaire de l’Académie française, 1835), though it is unlikely that the légumistes lived on peas and broad beans alone. 16. 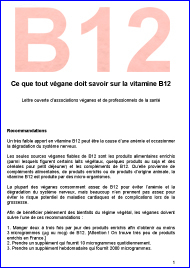 Vitamin B12 was not isolated until 1948. 17. John Davis, Extracts from some journals 1842-48 – the earliest known uses of the word ‘vegetarian’, from IVU website: http://www.ivu.org/history/vegetarian.html. 18. 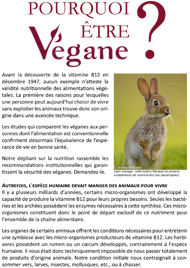 This point is raised in a speech by Vegetarian Society president James Simpson (see « Vegetarian banquet at Leeds » in « Chronique » in Le Mémorial français. Histoire de l’année. 1854). 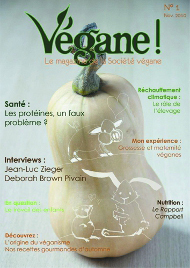 Davis (John), « The vegetus myth », dans VegSource Interactive, VegSource.com [en ligne], mercredi 1er juin 2011. —, « Vegetarian equals vegan ! », dans VegSource Interactive, VegSource.com [en ligne], mercredi 7 juillet 2010. Delesalle (Georges), Dictionnaire argot-français et français-argot, Paul Ollendorff, 1896.